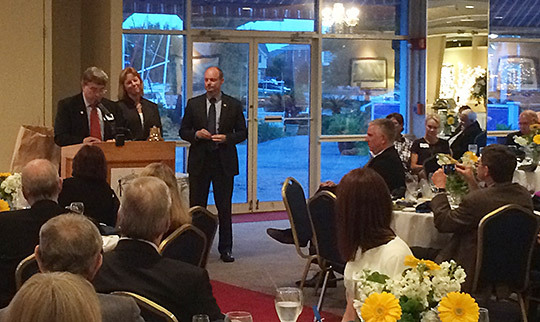 The Rotary Club of Pensacola celebrated its Change of Command June 30 at the Pensacola Yacht Club. The annual event celebrated the club’s centennial year and set the stage for another 100 years of service to the Pensacola community. John Appleyard led the Rotary Rooters in a presentation of highlights of the group’s 100-year history. Outgoing President John Shaffer gave an update on the Club’s flagship project for the year, a children’s playground at the Community Maritime Park and thanked everyone for supporting the project. The playground is nearing completion and should open in a few weeks. Incoming President Andrea Krieger and the new board members were inducted by Leon Hirsh, Rotary District Governor. Krieger spoke to the group about the value of service and her vision that the club will just as meaningful to the community in the next 100 years. Rotary District Governor Leon Hirsh introduces Club President Andrea Krieger.